One of the things I’ve done to tackle this for a good few years now, is to always take along a contribution to the buffet that you have prepared and know exactly how many points are in it! I find this way, I know I’ve got something I can eat that I’m going to enjoy, and I can track it without guesstimating. It got me to thinking, I should probably post some of my little party canape creates so, every Friday in December leading up to Christmas, I will be sharing with you one of my buffet/canape creations. The first is one I actually make all year round as it so quick and easy and always goes down a treat. Who doesn’t like meat, cheese and pesto!! Give it a whirl, you won’t be disappointed. 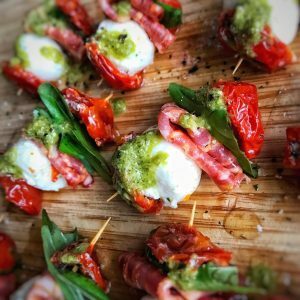 Mozzarella, Pepparoni and Pesto Boccones! 240g half fat mozzarella ball, sliced into 12 cubes (I got mine in Tesco if you can get a hold of the half fat ones, you could use 200g of the full fat mozzarella balls but each boccone becomes 2sp each). On to each cocktail stick add half a sun dried tomato, then a cube of mozzarella, then a slice of pepperoni/salami, then a folded basil leaf, then the other half of the sun dried tomato. In a bowl, add the green pesto, water and lemon juice and mix together. Pop the assembled buccone onto a plate and drizzle over the lemony pesto mix. Finish with a good twist of salt and black pepper.